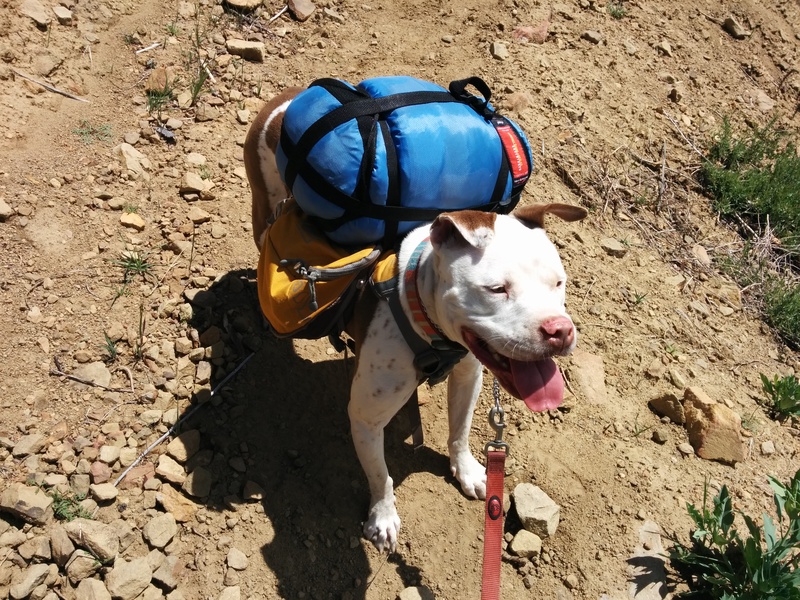 When we first started backpacking with Dakota, we had a lot of questions about gear. Does she need a pack? How about boots? Jackets? Suffice to say, Dakota is probably has enough gear to rival her human counterparts. The biggest question was about her sleep system. While some dogs have thick coats and are suited for cold weather, Dakota’s short coat does not retain enough heat to keep her warm. While on one of our trips, the weather turned from a 75 degree day, to dipping in the low 30s at night. Dakota was freezing. Her Rough Wear jacket (photo below) and bed were not keeping her warm enough, instead, she forced her way into our quilts and huddled close to our bodies. 2. Size – A small form factor matters. Dogs need to be nimble enough to navigate through technical terrain. 3. Warmth – Why else would you buy a sleep system? We found three options that worked best were, but not all satisfied the requirements. We bought a cheap and thick dog coat at our local pet supply store for about $20. The coat keeps Dakota warm at night and has holes for her legs to pop through. The problem we found is that it is bulky, heavy, and not designed to be used for backcountry camping. Dakota could not carry the coat on her own, and it added a good pound and a half to our pack weight. We had an old Suisse Sport sleeping bag in our gear closet with a broken zipper. Originally, we were planning to cut the bag up and use it as a quilt system. Instead, we used it as a full sleep system for Dakota. Bottom folded up into a bed, and the top wrapped around her body, keeping her warm in cold weather. At two pounds, it was relatively lightweight, Dakota could carry it with ease and this increases her cuteness factor by at least 10 fold. However, it didn’t stay on her very well, and when she moved around at night, we would have to get up to fix the bag so she would stay warm. By far the best solution was a child size quilt with snaps on the back. We purchased a used Enlightened Equipment Protege quilt. The Protege quilt was designed as a child’s size quilt, but is perfectly suited for a dog her size. The snaps allow Dakota to walk around freely with the quilt on in the morning, move around the tent as she pleases, and stays securely strapped to her. 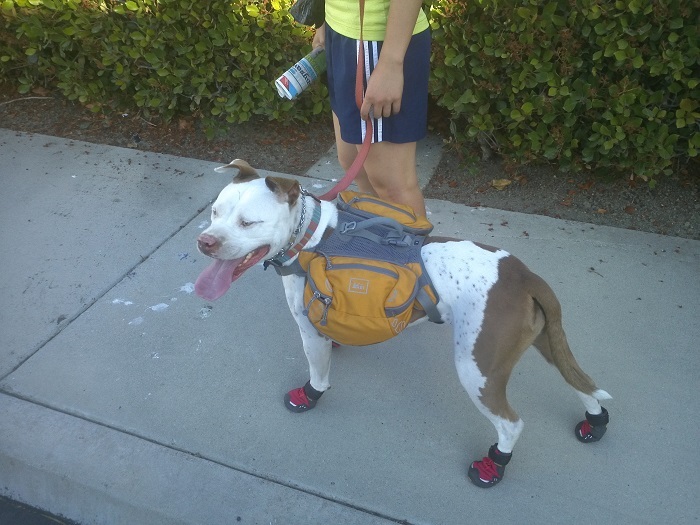 We’d love to hear what are some ways you keep your dogs warm during backpacking trips! Pros: Light, large storage pockets, well balanced and won’t slide off the dog, somewhat water proof. Cons: Price, weight distribution is important for proper fit, minor chaffing, straps will drag if not tied properly, belly pads move around a lot. I have always wanted a dog. It was one thing my parents did not give into during my childhood and I never quite got over it. When Louis and I bought a house two years ago, I decided it was finally time to start looking for a dog. Neither Louis or I have ever owned a pet before, the same excuses my parents gave me years ago plagued my thoughts. Are we capable of training it? Do we have enough time for it? What do we do with the dog when we travel? What kind of dog would we even pick? We wanted a dog around 2 years old. This way they are full grown, house trained and are lower maintenance than puppies. It was intimidating visiting some of the local shelters at first. Most of the dogs had a lot of pent up energy which can be easily interpreted as aggressive behavior for an inexperienced person. In the end, we couldn’t commit to any of the dogs we saw and gave up the search while I took a month off traveling Southeast Asia. I found Dakota at an adoption event while passing by Petsmart shortly after I returned from my trip. We had our eye on other dogs but did not notice Dakota sitting patiently in the corner. When a volunteer at the adoption fair found out we were first time pet owners, he introduced us to Dakota. 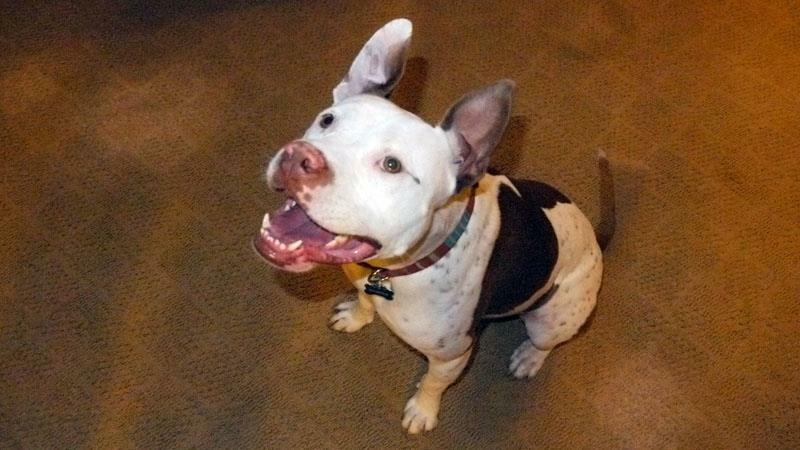 Dakota is an American Staffordshire Pit Bull and he described her as a great dog for a first time dog owner. Of all the dogs we’ve met in the past months, Dakota was the most docile, well socialized and responsive dog we’ve met. After spending a few minutes with her, we were in love. It’s almost been a year since we rescued Dakota and we are so thankful for all the happiness she’s brought into our lives. As lucky as we got with Dakota, we’ve learned a few useful tips that we want to share with first time dog owners. Know what you want in a dog. The easiest way to do this is to make a list similar to the one we made above and stick to it. Be logical about your choices, ask yourself is this a good fit? Bring a friend you trust if you don’t think you will be capable of making a rational decision! Remember, once you rescue, you are committed to this dog for the rest of their life, it is your responsibility to take care of this dog. Private shelters are great places to find the right dog. I found pounds to be intimidating places for the inexperienced dog owners. Private shelters usually rescue highly adoptable dogs from pounds and has better resources (i.e. foster homes, training classes, etc.) to keep these dogs happy. Their adoption fees are usually more expensive than the local pound, this is because they provide the dogs with so much more. When we met Dakota, she was well socialized and exercised because she lived with a foster family at the time of the adoption. This made it easy to see what type of personality she had right away. Sign your dog up for obedience training classes. The more well behaved your dog is, the easier it will be to find dog sitters when you leave town! Surround yourself with dog owners or dog lovers. These are the people who will be willing to watch your dog for you when you leave for vacation. Dakota is such a well behaved dog, it’s very easy for us to find her a place to stay when we leave town.